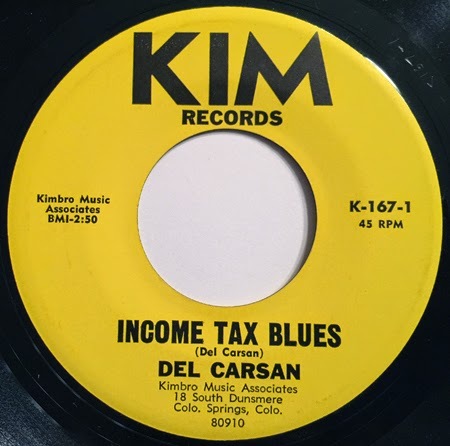 A bit early for an income tax song, but I have an Easter-related record planned for April. Nice hillbilly, ridin' the rails ditty about the revenuer man from singer, Del Carsan. Unfortunately, not a lot to go on. Address listed is in a Springs residential area, between East Pikes Peak and East Bijou. The current resident has no clue on the past owner. A search of the BMI register for "Kimbro Music Associates" brings up nothing, and a White Pages directory search for the singer's name - zilch. Flip side is an equally enjoyable country ditty, "My Plea."